Another great year for rock music draws to a close - so it’s only fitting that Fireworks last edition of 2013 is packed to the rafters with great stuff! 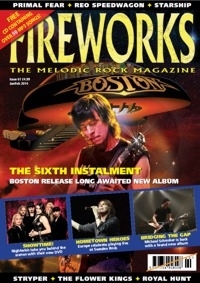 Fireworks #61 sees the return of multi platinum legends Boston. We have a double page spread featuring a fascinating interview with the enigmatic and elusive mastermind Tom Scholz. Meanwhile, Europe celebrate the release of their new live DVD and an excited Joey Tempest talks about that and the upcoming tour with Foreigner and FM. Michael Schenker returns with a brand new album, as do a surpassingly hard rocking Starship. With able support from Nightwish, REO Speedwagon, Benedictum, Stryper, The Flower Kings and more, there’s a host of great features for you to feast on! The last issue of the year also features our round up of the Best releases of 2013, along with the most comprehensive reviews section we’ve ever put out. 160 brand new albums reviewed, along with reissues, books and a wonderful look back at Firefest X. All that, and as Christmas is a time for giving, there’s a FREE CD containing over 50 songs in mp3 format for you. Go on, treat yourself!